After pink three days in a row, I turned to neutrals on Friday. The top is a v-neck cardigan in taupe paired with a feather printed skirt from, you guessed it, Anthropologie again. I used to shop at Anthropologie a lot obviously. Yikes. I do love the pattern of this skirt. It's all different tones and tpes of feathers and had overlapping seams with raw edges. But who am I kidding... it was all about the shoes. I put up a quick post on Friday about them but here are some prettier shots. You can open these up to full size. 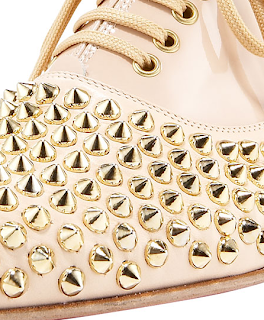 They really are spikey and wonderful. You can see why I felt that they were much more fabulous than I was that day. The cardigan top is from Target, the skirt from Anthropologie and the shoes are Christian Louboutin Freddy oxfords. More pink and green but this time it was leaning towards the preppy side, I guess. This really is one of my favorite skirts. It's hard to tell but the fabric is a tiny green and white stripe which is then embroidered with a beautiful hot pink pattern on the front. I paired this with a white knit v-neck top and white patent tassled heels from Charles David. I even put on a wide headband with large green and white stripes but I can only wear them for a short while. I end up getting a massive headache, sadly. I think white shoes get a bad rap. I don't know why. I love white shoes, especially in patent. 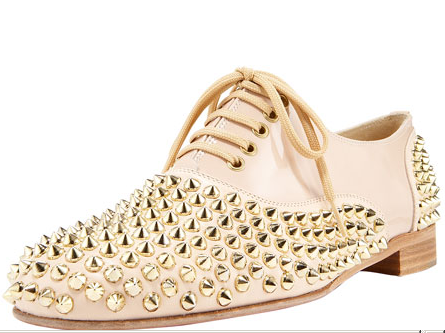 I mean, how classic and classy are these? The top is from Target, the skirt from Anthropologie (ages ago) and the heels are Charles David, also from 6+ years ago. I had actually planned on wearing this top with the rose print skirt from yesterday but the colors didn't really work. So I saved it and went for a more streamlined yet still soft look with a charcoal cropped cardigan and a khaki pencil skirt. I really like these three colors together. 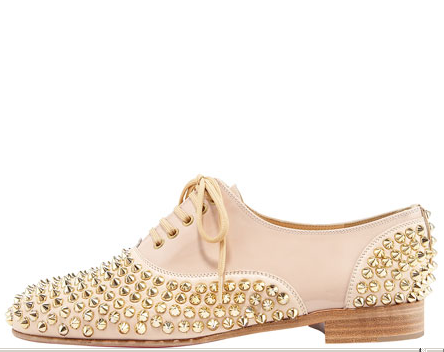 They are all dreamy and pair together to in a nice feminine way. The rosette on the shirt is such a neat element and becomes the focal point. 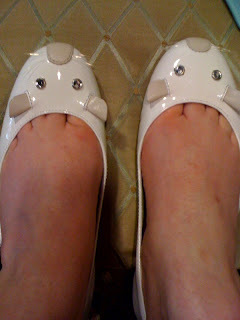 What I really wanted to wear, though, were these pale pink heeled sandals. 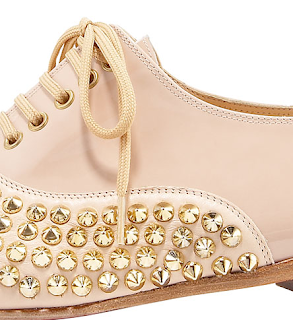 They're the same color as the top with organza butterflies on the heels. The grey cardigan picks up the grey stripe on the wings. The heels are Colin Stuart from ages ago. The butterflies are still holding up, thank goodness! I believe I got them from the Victoria's Secret catalog 8+ years ago. They were not expensive, as far as I can remember. The top was from Anthropologie and the skirt and cardigan were from Target. I started off last week with quite a bit of pink going on. I really love a pretty patterned skirt and have had this one for a number of years. The fabric is a beautiful chartruse-y green with old-fashioned roses in pink and yellow. I wore a pink JCrew cardigan over a pink cami and paired this with bright pink patent Christian Louboutin simple pumps. 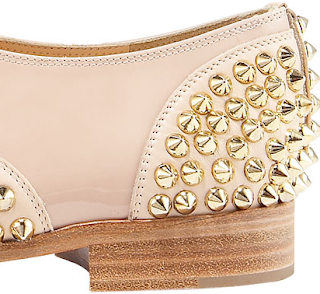 These are really are a comfy pair of heels. It was Monday but it felt better to be bright and cheerful starting the week. It's been a busy, stressful and exhausting week for a number of reasons. So when I woke up today I was feeling less than peppy. I don't know about you, but I often dress to suit my mood. Good mood = fun clothes day. Maybe I feel flirty or peppy or in need of comfort. I am reflected in what I wear. 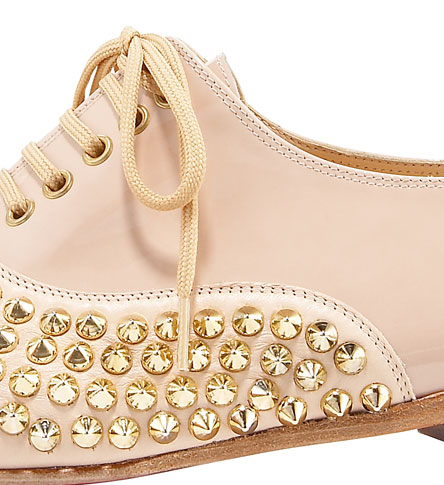 Christian Louboutin Freddy studded oxfords. They're flat so I'm not going to crazy but they are definitely in your face. 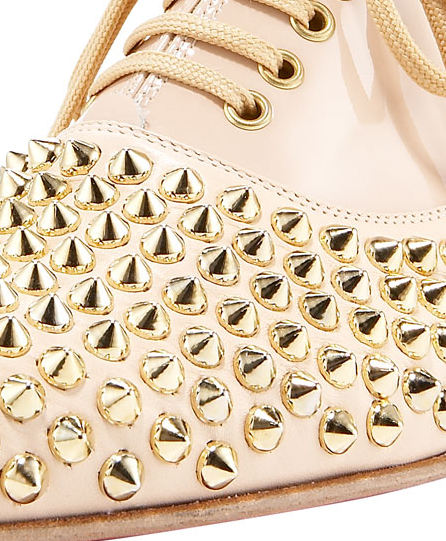 Shiny, studded, fabulous! I just hope I can keep up with them!!! 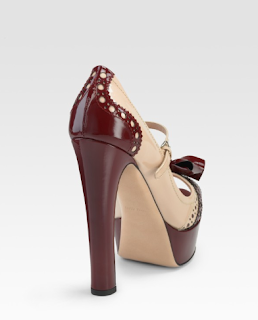 While we all adore and went a bit ga-ga cutesy over the Miu Miu spring collections, I'm just as smitten with the fall heels. 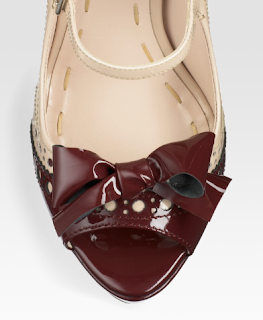 I love love LOVE these wingtip-inspired patent peep-toe heels. The color combination is gorgeous, they're mary janes and have a bow. Miu Miu Spectator Mary Janes - $650 from Saks Fifth Avenue. Saturday I was able to have a fun day out with my sweetie. He suggested that we go out to lunch and to our favorite antique store. 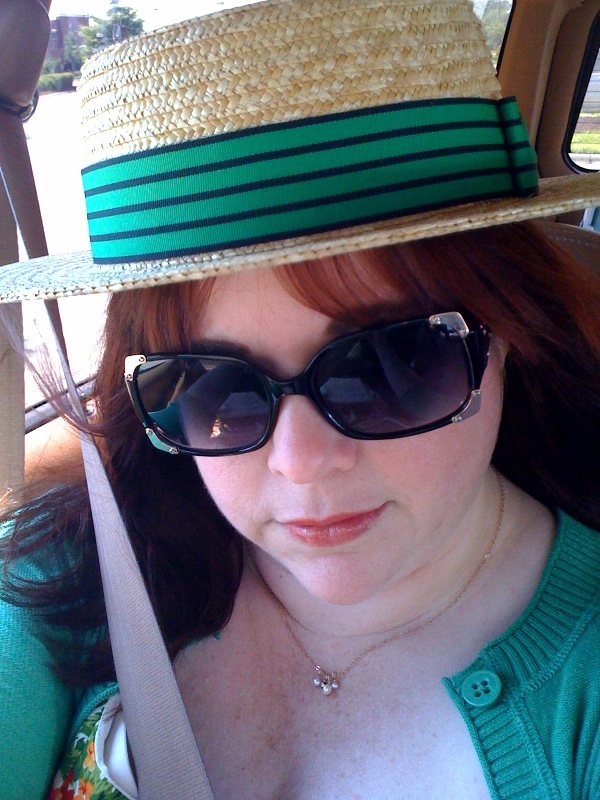 I love when we go out to something other than doing errands because I use it as an excuse to wear some of my favorite things, like hats, that I just don't have the time to incorporate on my way to work. It was very warm out but I knew we would be running in and out of the air conditioning. I wore a very bright floral dress (and probably my only yellow piece of clothing) with a light cropped cardigan. The dress is a few years back from Target's Isaac Mizrahi line. I wanted a very summery mix and to play up the green too. So I used my Stephen Jones boater, a vintage wicker-y bag, my lace parasol from Venice and Jessica Simpson Pegeen heels. Here is the dress without the cardigan. The waistline is a bit above my natural waistline so it has more of an empire feel to it. The fabric on this is the best part. The bodice has the bigger pattern. The skirt is pleated with a smaller pattern on top of the box pleats and a larger pattern in the folds. The dress is even lined so it's a pretty nice quality for a mass merchandiser. Because it was so warm I kept the jewelry simple - a very delicate gold chain with pearls and a gold bead. A hat close up with the green and navy ribbon. I like the preppy colors of these shoes but they are not great for walking a lot, I'll admit. I ended up changing into my favorite Keds after we ate lunch and before we walked around. I was happy to receive several compliments as we visited the shops. It's funny how, when you take the time to put on something just a bit nicer, like a dress, how sweetly people respond. Talus seems unimpressed. Maybe these kitties and mice will get along better. This dress may be the best thing I've bought recently. I have worn it plain, with cardigans and camisoles. It's the perfect shape and color and is just really darn comfortable. On Friday, I wore it to work with awhite cami underneath and my new "mouse" flats. Yes, it's just a cotton jersey dress but it has some cute elements like the great deep v-neck and pleats on the shoulders and little tabs pulling in the waistline. The hem has an unexpected band with raw edges which match the waist tabs. My jewelry was equally simple. A large oval moonstone ring set in beaten silver and this necklace I made from my posey ring and a small crown charm. How do you stay comfortable and cute at the same time? Urban Outfitters - We say "Fifty Percent*"